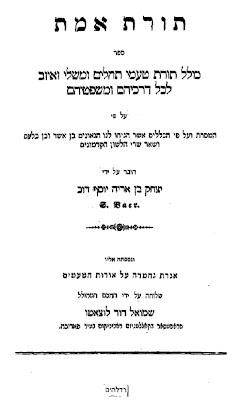 Here is a haskama by R. Samson Rafael Hirsch to the book תורת אמת by Seligmann Baer. 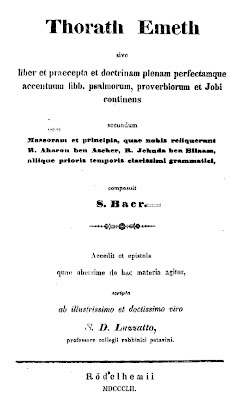 This comports well with Baer's methodology, which earned him the designation as a latter-day Massorete in the evaluation of critics, that the way to edit a biblical text was not to reproduce a manuscript, but to freshly apply the massoretic rules, whether as found in massoretic manuals or as discovered by experts like him, to the text anew. Interestingly, he published his editions of the Tanakh, complete with lengthy introductory essays in Latin, in conjunction with Franz Delitszch, the great Christian Hebraist, Judeophile and missionary. This last point is particularly interesting, because one simply cannot imagine a Jewish editor of a Bible collaberating with a Christian missionary today, and one simply can't imagine one such as R. Samson Rafael Hirsch thinking warmly of the person that did so. (Granted, this part is speculative, as the collaberation was later. However, it seems difficult to conceive of Seligmann Baer of Thorath Emeth being essentially different from the more mature Seligmann Baer, who was certainly still highly regarded as a religious scholar of the highest caliber.) My guess is that at the time in Europe, a friendly figure such as Delitzsch whom, moreover, tended to accord respect and sympathy to Judaism and to actual, living Jews (even while he hoped and worked for the conversion of the Jews) was of sufficient rarity that such a figure was appreciated rather than shunned. In addition, today, whether in America or Israel, there is a certain amount of independence and self confidence which circumstances affords today's Jews who might be more discriminating in who it sees as its friends or people worthy of being acquainted with. Truly it takes a sincere אוהב ישראל to look for and see the beauty in בדיקות. 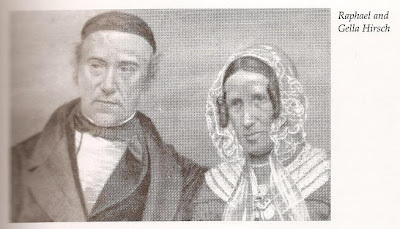 One of the famous 19th century Jewish-born missionaries was Joseph Wolff, born in Bavaria in 1795, who converted to Catholicism (1812). He studied in Rome, but was eventually expelled for heresy. An English banker based in Rome named Henry Drummond brought him to England. There he became a Protestant and was signed up as a missionary for the London Society for the Promotion of Christianity Amongst the Jews. 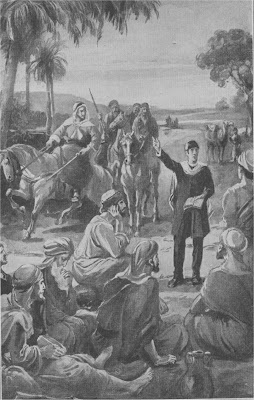 When the Society did not send him on a mission, Drummond himself financed a trip to the Middle East for him, including to (what I will call) Israel. This he did in 1821-22. Wolff then published an account of his travels in the form of journal entries, and very interesting they are. Included in his account is a meeting with one of the foremost students of the Vilna Gaon, Rabbi Menachem Mendel of Shklov (1750-1827), who had emigrated in 1808 with a group, was then the leader of the Ashkenazim in Israel. I know that this is unusually long, but it's well worth reading. If you want to read the parts I left out, plus much more, do see the Missionary Journal and Memoir of the Rev. 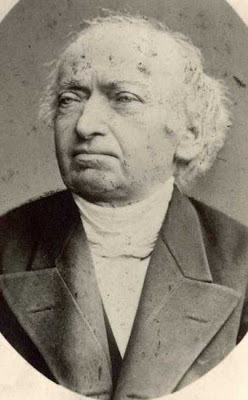 Joseph Wolf, Missionary to the Jews. It's definitely worth checking out Eighteen Treatises from the Mishna, an English translation of 18 massekhtos from 1843. See the circumstances surrounding its production in the Preface below (and check out that footnote!*). This is the not the first English translation of a part of the Mishnah. I believe that honor is due to William Wotton, whom I blogged about here. * But see here about a question of delicate sensibility in translation, where an English machzor from 1796 translated mei raglayim, and a siddur from 1949 didn't. Of course, the translator of the machzor was an Ashkenazi; the translators of the Mishna were Western Sefardim! Apparently Tiferes Yisrael was preceded by Jost. הכין; in the Bavli the final n is dropped, and the form הכי is typical (Berachos 18b, מאי טעמא עבדת הכי). הדא; in the Bavli the d has been dropped, and the typical form is הא (Zevachim 44a, כי הא מילתא). קדמייתא; in the Bavli the d is assimilated to m, so we find קמייתא (Gittin 55b, גזרתא קמייתא). לנא, קדמנא; in the Bavli the final letter is dropped and forms are קמן and לן (Chullin 11a, כי קא מיבעיא לן רובא קמן). The explanation Breuer offers, convincing to my mind, is not merely that language changes. This is true, but typically we would expect the Bavli forms to be later, as languages have a tendency to decay, drop sounds and letters, become less flowery than the classical form, not more so. The explanation may be that the teshuvas ha-Geonim were written and therefore preserved a more classical form of Aramaic. The Bavli, however, was oral until it was written down, perhaps early in the period of the Geonim, and so the forms it preserves are actually a later, spoken form of Aramaic. The context is his evaluation of Philo, who he calls Yedidya of Alexandria. He lists four complaints he has about him. This is the third. Are you a student at YU and a fan of On the Main Line? From The Monthly Review, vol. 24, 1797. Review of George Benjoin's translation of Jonah. 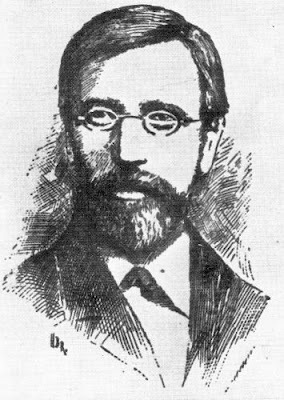 An illustration of the disdain the Eastern European Yeshiva had towards the Anglo-ecclesiastical leadership can be found in an oft repeated comment by one of Jacobs’s teachers in reference to Chief Rabbi J.H. Hertz: “If a reverend is a goy. It must follow that a “Very Reverend” [Hertz’s title] is a ‘great goy’ (a grosser goy).” Hyperbole aside, the sharp remark is illustrative of the degree to which Jacobs’s Yeshiva environment understood itself vis-à-vis the pre-autochthonous institutions of Anglo-Jewry. Pg. 18, Teyku: The Insoluble Contradictions in the Life and Thought of Louis Jacobs, Phd. dissertation by Elliot Cosgrove (download here). From the Samson Raphael Hirsch Jubilaeums in Der Israelit No. 25, Jun. 6, 1908 (pg. 7 of the Hirsch section). You (or I) could have bought this issue on auction a few years ago. (link.) But in the meantime, all I've got is this bad scan on Compact Memory. A cache of high school הסטוריה notes and teacher handouts from a Lakewood Bais Ya'akov recently came into my possession. The important thing to remember is that the following is 100% authentic. As you can see, this is a quote from I. B. Singer, Yiddish Nobel laureate, from Conversations with Isaac Bashevis Singer. You can also see that text is blotted out (probably with white out). What was so bad about the few words written after "baron," and later, "proud," that it was judged unsuitable for these students? I found it interesting that this was so unsuitable, but I. B. Singer is, in general, acceptable as a source for reinforcing a point. The truth is, this is really a kind of קבל את האמת thing, is it not? Personally I dislike the idea of presenting texts with the censor's line blatantly present. I realize that such schools are doing the right thing and voluntarily separating and forming an enclave where they can teach whatever they wish. This, rather than forcing it onto others, is proper. However, I can't get behind being so blatant about censoring texts in this way, as opposed to showing texts at the outset that don't require snipping out a phrase here and there. On the other hand, that reflects my own values. From their point of view, this may not have been a sloppy job at all, but an overt message for the students: "We may feel that 99% of a certain source is appropriate for you, so we will show you 99% of it. The fact that we feel that 1% is inappropriate neither means that we will show you that 1%--alas--or show you none of it. The 99% will not lose out on account of the 1%. And we're happy to let you know that this is how we feel and see exactly how we do it." Either way, it's interesting that the problem seems to be simply calling attention to the fact that men notice how women look.